We had met people back at Village Creek who extolled the glories of Goose Island State Park. They had spent two weeks there, the limit for a park stay, and were heading back for another two weeks. Our anticipation was high. The drive to the park entrance ran through the most atmospheric stand of live oaks. The trees were old and quite large but bent and craggy from the winds and weather. A herd of deer were grazing under gnarled limbs of the trees. It was quite an entrance. We checked in at the ranger station and were given a choice of potential camp sites. The park has two camping areas. The Lantana Loop was in the interior of the park. The camp sites were tucked amongst more live oak trees and palmetto. The Bayfront Loop ran along the shore of the bay and formed the top of a “t” and we chose a site the right hand arm towards the far end. Here was yet another installment in the Great Texas State Park Mystery. Why was it impossible to make park reservations, but when you got to the park, it was half empty? This had happened at Brazos Bend as well. Since we had been unable to get reservations at so many Texas parks, we had to wonder if they were all really full or similarly empty once you actually got there. A puzzle. We backed into our site. We were literally 20 feet from Aransas Bay. Holy cow we had won the lottery! We set about unhitching. Next to each site on the Bayfront loop was a cement structure sheltering a picnic table. At first we thought they seemed ugly and clunky. But it did make an excellent shelter from the sun. We set out our mat, the chairs, the flamingo, the wind balloon and I established my desk in the shelter. We settled into our chairs with a drink and enjoyed the late afternoon looking out across the water. This was close to paradise. The next morning was a bit cloudy. I enjoyed coffee in my office outside and was preparing for a nice morning reading the paper on my laptop when the wind started to blow, the skies darkened and it began to rain. I ran for the trailer with my laptop. A real storm whipped up and tossed the chairs, upended the table, blew the flamingo down and ripped Jim’s happy wind balloon to smithereens! It rained all day and all night. The wind buffetted the trailer and the rain lashed everything. We huddled in our Airstream warm and dry but after a while we felt pretty cooped up. The next day there was a brief break in the onslaught and we headed outside to walk the Bayfront Loop and the Lantana Loop of the campground. We wanted to explore and we really wanted to move around a bit. The bugs were ferocious. Clearly these mosquitos had been starved and were making up for lost time. We made it back to the trailer dry and just in time for the next spate of rain. It was still grey and overcast the next day and we decided to take a drive. We headed over to Rockport to poke around. This is clearly a beach and vacation destination for people from all over Texas. Rockport had all of the accoutrements of a beach town: lots of vacation homes, little shops, restaurants and several marinas with boats. Even sodden it looked like a nice place. We hit the local H.E.B. supermarket and when we emerged the sun was shining and the air was very warm. It felt so good to see the sun! Ashland, Virginia is a really pretty area. The countryside is thick with tall pine trees. While we were in a fairly populated area, it felt very rural. Even the shopping centers were surrounded by pine forest. Walmart never looked so good. 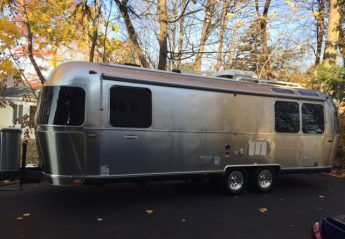 We were staying at a very well run and commodious campground, Americamps, and were looking forward to a couple of days in one place without the activity involved in moving the Airstream. There was even a craft brewery, The Center of the Universe, just steps from our Airstream door. What more does one need? We were sorry to go, but the news media was full of alarming reports about the coming storm. It was the Snowpocalypse. I consulted the woman in the campground office and she agreed that things were going to be crazy. She was concerned how long it would take for them to clear roads since they just don’t have the equipment for it. Also, no one that far south knows how to drive in snow and ice. With this in mind, we reluctantly hitched up and headed to our next planned stop. We had reserved at a KOA in Greensboro, North Carolina. As big fans of Longmire on Netflix, we were seduced by the cheery way they answered the phone, “It’s a beautiful day at KOA!” I hope this will prove to be the nadir of our campground experiences. We got settled in as the first flakes of snow were falling. A brief trip to the supermarket to stock up essentials displayed a populace in full panic. The shelves were completely empty of meats, water, milk and other essentials. There people were out of their minds frantic. That was scarier to us than the storm. The next two days were the toughest part of our trip so far. We were socked with eight inches of snow and ice and below freezing temperatures. Not having expected winter weather, we were woefully unprepared for deep winter—no mittens, boots or heavy coats. Life in an Airstream in the extreme cold and ice is a little dicey. Our trailer kept us warm, but it was a lot like living in a tin can. A tin can on very slippery ground. It was pretty miserable. We were burning through propane at a fast pace keeping warm. The manager and owner of the campground took a powder and were nowhere to be found. We ended up unhitching the truck and heading to a local U-Haul place to refill our propane tank. As the cold worsened, the pipes in the campground bathroom froze. We were very happy not to have de-winterized, but that made us dependent upon the now freezing public facilities. After two days waiting out the storm and for the roads to be cleared, we hightailed it out of there. The road from the campground was a sheet of un-plowed ice and snow. We held our breath until we reached the highway hoping we would not end up in the ditch.